Taylor Wernsing is a senior in kinesiology. She transferred into the Department of Kinesiology and Community Health from the Division of General Studies in her sophomore year. The KCH Department offers a scientific and psychological based curriculum with top-notch faculty and hands-on laboratory courses. Class sizes are fairly small, which allows students to develop personal relationships with the professors and one another each semester. I truly love what I study and have a passion for sharing it with others! I am involved as an Undergraduate Research Assistant in the Exercise Psychology Laboratory directed by Dr. Edward McAuley. I participate in research activities that focus on the causes and consequences of physical activity behavior across the lifespan, especially in older adults. I have learned more throughout this unique experience than any classroom setting, and it will be highly beneficial for me in the future. Upon graduating in the spring, I plan to attend graduate school for 3 years and receive a Doctorate of Physical Therapy. 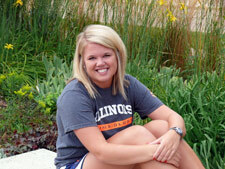 I am a member of Chi Omega sorority, Illini Pride and Orange Krush, and the Pre-Physical Therapy Club. I am also an employee of Champaign-Urbana Special Recreation and help coach a volleyball team for the Special Olympics. I enjoy running, reading, boating, cheering on our Fighting Illini, watching St. Louis Cardinals baseball, and spending time with my family. Why would you recommend KCH and the College of Applied Health Sciences to others? AHS and the KCH Department both offer a wide variety of degree and career options best suited to your healthcare interests. It is a fun learning environment that provides many great opportunities to enhance your education outside of the classroom. I could not be more pleased with the preparation that I have received for my future career, and I know that KCH has given me the tools to become a successful healthcare professional.